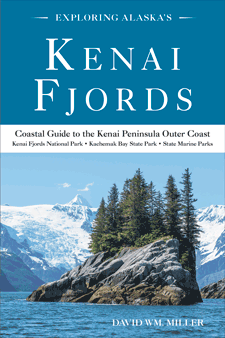 Guidebook to the Kenai Peninsula Outer Coast, since 1984. Bulk Rates for Kayak Groups - Free Shipping in USA! Exploring Alaska's Kenai Fjords Guidebook is a collection of coastal and maritime information focused on Alaska's North Gulf Coast, especially the 800-mile-long coastline from Port Bainbridge (in Western PWS) to Port Chatham (at Cook Inlet's E entrance). It includes major places of interest, important vessel anchorages, reliable kayak beach landing sites, parks and public lands, natural history, local stories, legends, glacial information, photographs, maps and historical prints. Exploring the Kenai seacoast is my hobby. 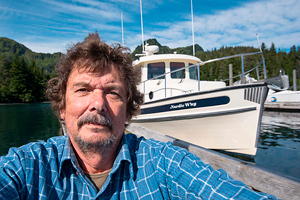 It began when I homesteaded in Day Harbor, more than four decades ago. After many seasons of commercial fishing, living and traveling on the outer coast, my wife Anne and I published the original Kenai Fjords Guidebook in 1984. This 2017 edition of Exploring Alaska's Kenai Fjords, includes 43 upgraded maps, 140 photographs along with a raft of pertinent Kenai Outer Coast information. I recommend it for planning purposes and as a reference while in the fjords.